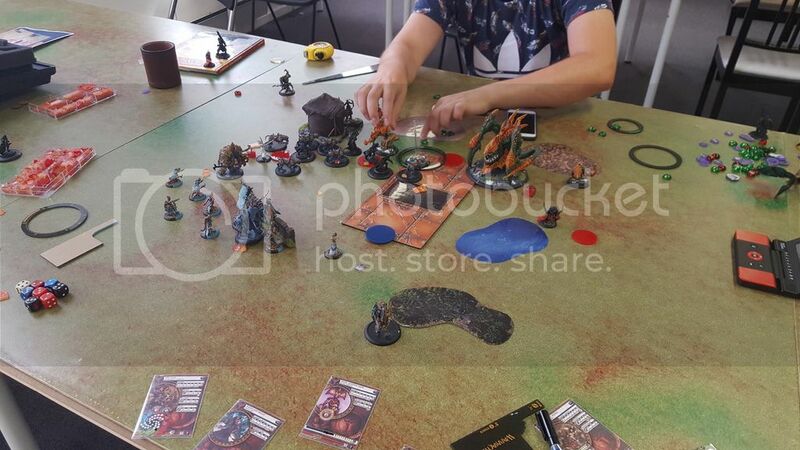 Got the chance to play a few games today, first of which was against Legion! He's testing out an experimental Vayl 2 list at the moment with an Archangel! I thought that to fight experimentals, why not use my own, so Makeda2 vs. Vayl2 it was. Who would get out ahead in this battle of Leading Ladies? Let's find out! So, what to think about this? Luckilly for me, i played a game against this list a few weeks ago, that time with a pXerxis list that's basically a cross between my current pXerxis list, and my Mak2 list. I came out on top in that one after a single Ferox One shotted Vayl in a crazy assassination run that i only attempted because my opponent had to leave. The list isn't expecially fast. At least not compared to my own.. His shooting can be a real pain, but without any kind of tools to negate Tough/Stay Death, it shouldn't worry me too much. The Hellmouth is a whole different story however. It can pull models out of formation, or within threatranges of his other stuff. And it also allows him to drop spells into my Deployment Zone before i even get the chance to move. I would have to be careful about that. We played Recon, He won the roll off, and decided to go first. He deployed Archangel and Raek on my right flank, while Vayl and the rest stood opposite the other flag. Deathstalkers on wither flank, while the Hellmouth (Proxied by a cav model and three Ogryns) hid behind the House. I deployed centrally with Ferox on either flank, the plan was to be able to shift to whatever side he decided to go for, move in to score and force him to commit. With the survivability and mobility of my list i were pretty sure that i could push him back and begin to Score in my T2 on the side he decided to go for. 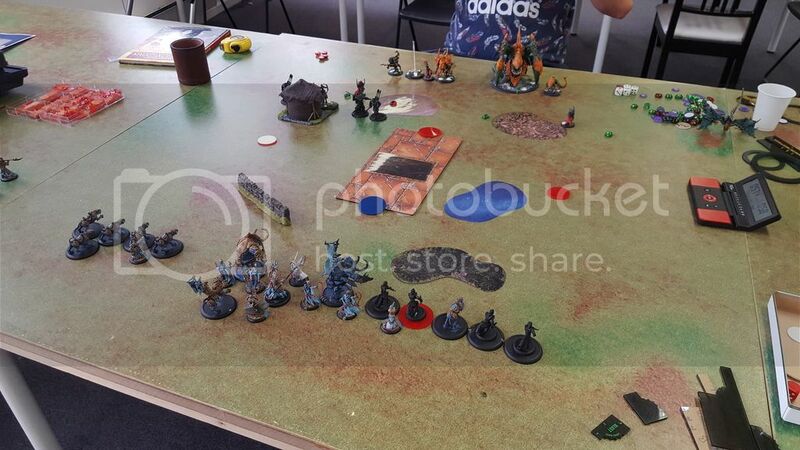 In doing so, he would have problems scoring as he basically has no way to block my Ferox, and Vayl would be far to exposed if she tried to shift over to the other Flag. Either that, or just not do anything herself, and i pretty much consider that a win anyway, as she's one of the primary problems i have to deal with in his list. He moves everything up the board. One Deathstalker shoots a Hellmouth Tentacle, the Hellmouth activates, the new tentacle it can place much further up the board runs so that it is within 8" of two of my Ferox. 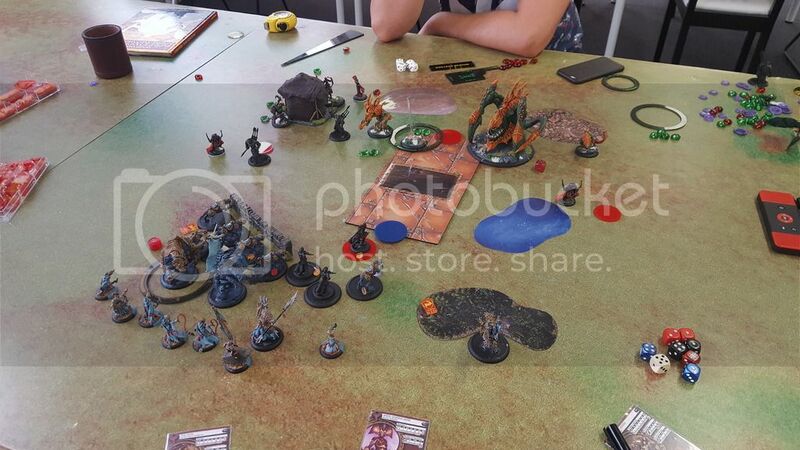 Vayl activates, Shoots the Tentacle and throws two Chastens on my un-Toughed Ferox, forcing me to use two Fury to keep them alive, Meaning i have to cut myself for Fury T1! I move up a bit, following my plan to shuffle to the side he has Vayl on. Most of my guys hide behind the Wall for the DEF buff against his shooting. I take care to place the Sentry within 3" of all the left Ferox for SHield Guard purposes, while still being far enough away from everything that if he takes an AOE from one of his shooters only he will be hit. 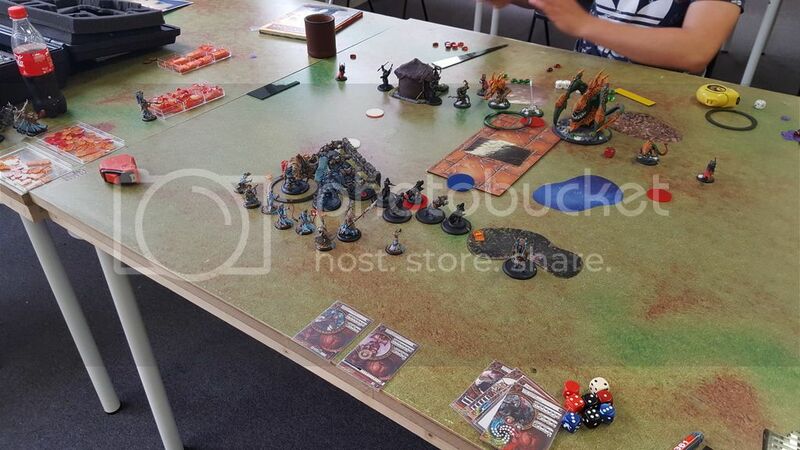 I opt Not to kill the Tentacle (the barelly visible proxy base on the top left of the Wall in the picture above). What this means is that he have to take a free strike to move it away, which he wants to do as it's engaging three of my cats, making channeling from it impossible, and meaning that the Deathstalker that really wants to try and kill a few cats will have a hard time hitting anything. Radheim hides behind the Woods, waiting there in safety until i need him. This also means that it's much harder for my opponent to move his left flank elements over since that means that they will have to enter my threatranges on the way. He moves up a bit to contest the flag in as many places as possible, then starts shooting. At the end of this, all but one of the Ferox is down to one box. All his AOE's were targeting the Ferox on the right, so when the Deathstalker on the left flank activated (The last model to do so) and moved up to try and kill a few Feroxes (Makeda was all out of Fury at this point) i Shieldguarded that insted, Stranding the damn solo right next to my lines. The plan is simple now. 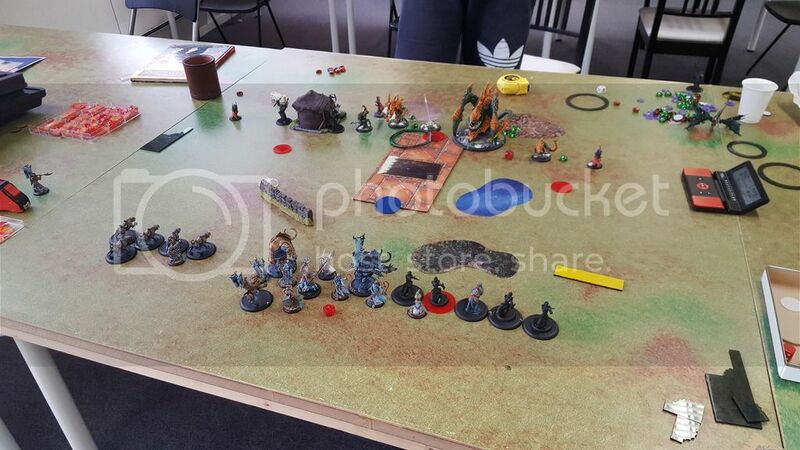 Remove everything that contests, and then move in to do as much damage as possible and Jam with the rest, then set up for a countercharge after he commits next turn. He held back his Feat last round, so i know that it's gonna happen in his next round. A Ferox dies to Continous fire from the Archangels shot, i decide that it's not that important to keep it alive, and instead keep all my Fury. 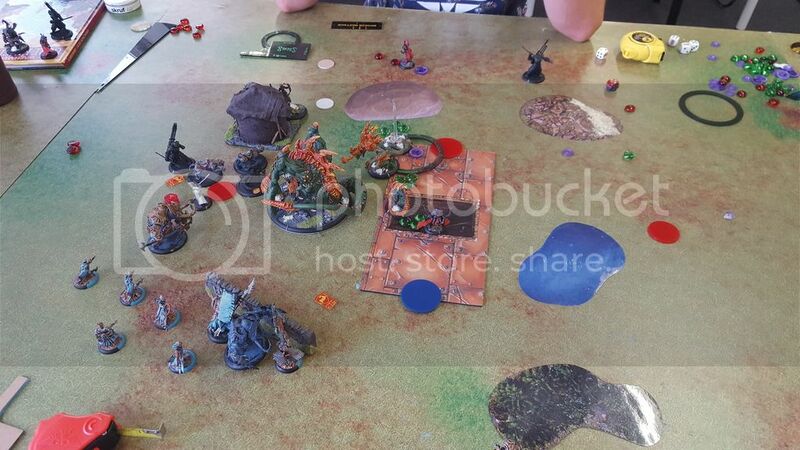 The Left Ferox activates first, clearing out all the contestors, then reposition to block his path to the FLag. The other unit swopps in and put quite a bit of damage on the Ravagore and Seraph, then jam him up. Makeda runs to the Flag, and the rest of my Army just shuffle a bit to set up for my Next turn. He tries to see if he can do anything but commiting, but decide that there's nothing else he can do. Vayl is in a terribly exposed position, and have no easy way over to the other flag. I have a few Ferox in the Zone, and if he decides to try and Score there, he's within range of pretty much everything i have anyway, so there's no point in holding back. He Feats with Vayl, doing some damage that i negate with Stay Death and Tough. Everything he has left commits and kills all but three of the Ferox and one of the Willbreakers. A tentacle contests my flag. He's played right into my hands and i finally commit everything. Makeda Feats and cast Storm Rager on one of the Ferox. The two enraged Titans move in and kill the Archangel, Radheim and the Tycom charge the Raek+Deathstalker in the trench, killing the latter and leaving the Raek on a single Box (Radheim was just outside of my Feat and failed to roll the 5+ needed to hit the Raek in the back), The Ferox activates and finishes off the Seraph (The Storm ragered one rolling triple boxcars on his charge attack!) and dents the Ravagore even further, leaving it with a crippled Body aspect, and kills the contesting Hellmouth Tentacle. With pretty much his entire army gone, and the rest locked down by Ferox, my opponent concedes. Looking back, i don't think there's much my opponent could do differently here. No matter which side ha chose to go for i could pull off the excatct same moves, blocking him out and strike back to cripple him. Granted, My damage dice were on fire this game, but even with average rolls, i should be good here. His list just don't have the damage output to get through the wall of Ferox without committing heavilly in meele, and in doing so, exposing himself to my countercharges. 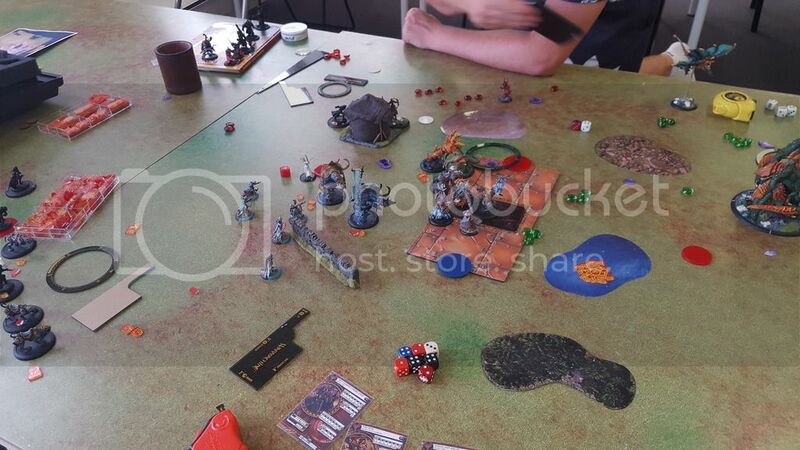 He even got thae maximum shots possible from his beasts, and a few spells from Vayl, and the only reason i actually lost a Ferox to all that shooting is because i decided not to use Stay Death on a Fire continous roll. The versatility, mobility and incredible survivability of this list continues to impress me. I still haven't had a single match where i fell it's unplayable. I'm looking forward to testing it more!